A petition demanding that the Conservative Government reverse its cruel and unwarranted £30-per-week cut in Employment and Support Allowance has gained nearly two-thirds of the number of signatures needed for a Parliamentary debate – in just three days. ESA is the main income-replacement benefit for people with long-term illnesses and/or disabilities, and the cut affects people in the Work-Related Activity Group of claimants. The petition text states: “The House of Lords has been unable to stop a planned £30-a-week cut to disability benefits forced through by Government MPs. 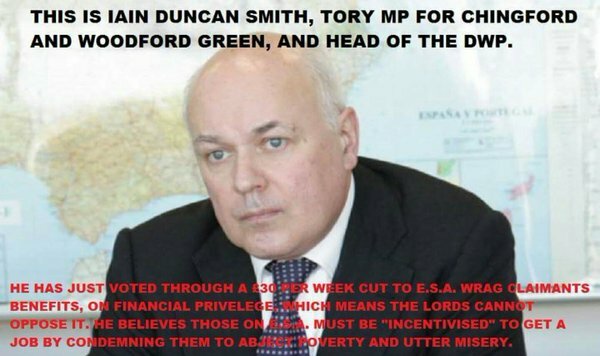 This will cripple those in receipt of these benefits, leaving many in literal poverty. It needs 100,000 signatures within six months in order to be considered for a debate in Parliament. At the time of writing, the total stands at 63,037. Alerting Vox Political to the petition and its popularity, commenter Debbie Smith wrote: “Vulnerable people are dying because of our government. “If we do not fight this, they will keep going with their social cleansing and class warfare. The petition may be found at https://petition.parliament.uk/petitions/124016. Additional: The £30-per-week cut was discussed on Channel 4’s The Last Leg on March 11, including an impassioned attack on Iain Duncan Smith, the Work and Pensions Secretary, by disabled co-host Alex Brooker. I’ve signed, i just wish I could sign it more than once!! Signed the petition but the email I sent my MP was not a request for a change of heart – he doesn’t actually have one. Just a quick advisory, I have today signed the petition to have the cuts of £30 per week for the most vulnerable in our society currently receiving ESA. Anyone showing such contempt for the less fortunate is, as my mother would have phrased it, a “cad and a rotter to the core”. At 60 years old I remember well the days when the disabled were mocked as “spastics” and “spazzies” and I resolved never to discriminate against the less fortunate. What a shame that we come from such very different backgrounds and from parents with such diverse moral viewpoints, but it is never too late to repent. You don’t know him Mike, he’s quite a two faced creep and would never put others before himself, he’d much rather shoot himself in the head. What’s shocking is that this issue has hardly been discussed in the corporate controlled media – a conspiracy of silence and censorship by omission, in the name of BBC balance guidelines. Regardless of the number of people signing the petition, a rule of law against their behaviour, this government will do whatever it wants because they were put in power by the people of this land. This lot in power now could not care less about how ordinary people’s lives are affected, they don’t know what an ordinary person looks like or how they live and work, we, those below their station, stature, serfs, slaves, plebs, or whatever they want to label us are here to simply supply them with everything that they are entitled to. They do not respect the laws of the land, they will spend millions of tax payer’s money fighting for their stupidity but we are powerless against them, they know this, there is no simple resolution against the the way that they are attacking the fabric of our lives, but are we really powerless? The answer of course is that we are the ones who pays our taxes like good citizens month after month, especially council tax, we don’t have a choice about taxes taken from us before we receive our wages or the goods from the store, we could always cancel our direct debit payments for council tax though. Put in power by the people of this land? Three-quarters of the electorate didn’t want them, and the electorate isn’t even all of the people of the UK! As for the rest of your comment, I certainly would not recommend lawbreaking – two wrongs don’t make a right. I’d pretty much agree with the rest. lets all sign petitions opposing tory policies irrespective of what policy. you can be sure all policies are self serving intended to enslave the population. We don’t need an Impact Study. It’s pretty much obvious what will happen. The amount of children in danger of violence etc will rise. Depression and suicide will rise. The amount of people using and dying from drugs and alcohol will rise, even if they can’t afford it they will find ways to escape their misery. Oh and starvation. that too. Crime will go up as people resort to theft, burglary etc to pay for food and bills etc. and our government wants to start imprisoning the homeless. Social cleansing and class warfare by a Tory government. No study needed. No experts needed. Sign the petition before we have to try and cross borders with our loved ones. I note with interest in the constituency where I live, St. Ives, Cornwall 226 people have signed the petition, in IDS’s constituency only 87 have. everyone of these people with so much power do not know what poor or struggling is???? they do not know the meaning of the word hungry or cold ……..they do not live in the real world……if they did they would never do what they are doing ……blood is on their hands…..
blood is also on the hands of tory voters. They will be affected even if it means they will feel obliged to help an ageing parent or grandma etc. shame on you tory voters you will get regrets of your ill- chosen vote.